Vegetables- while they may be full of important vitamins and minerals and tasty once your palate has matured, there is one hard fact about them. Kids don’t like them. I’m fairly certain that even when man was first venturing from his caves and Momma and Poppa Caveman served their cavechild a flat rock upon which rested a steaming flank of mastodon with a side of leafy greens, even cavechildren would try to eat around their vegetables. It seems to be a fact of life that children will always do anything they can to get out of eating their vegetables and that is the premise perfectly encapsulated by Bad Beets. 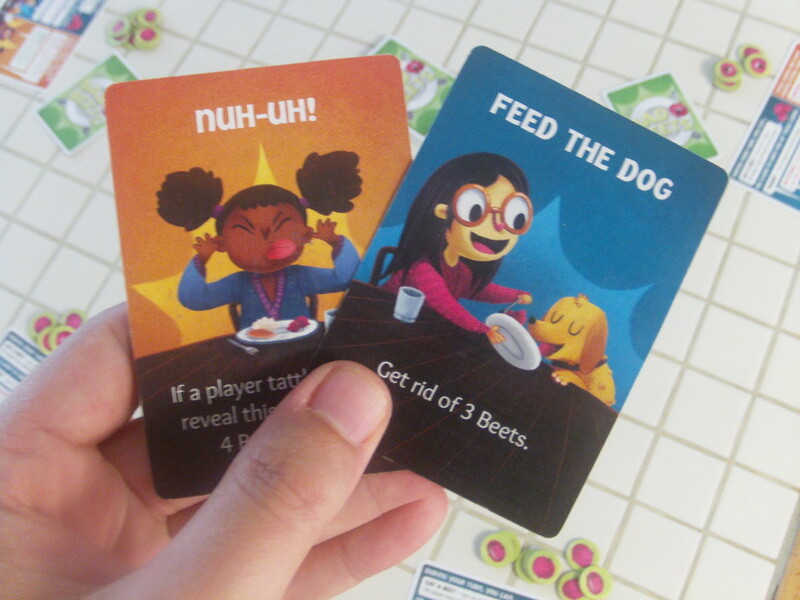 Bad Beets is a bluffing card game published by Stone Blade Entertainment. 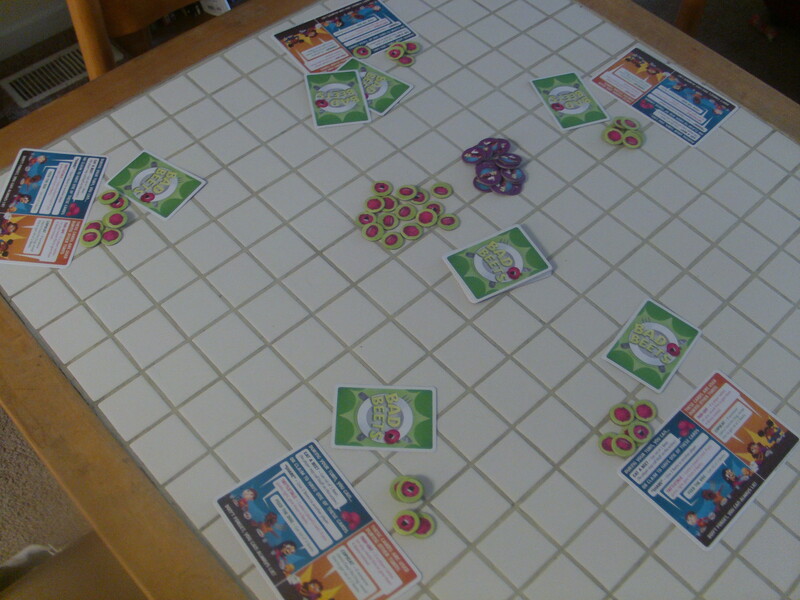 It is a game for 2-5 players, with games lasting about 15 to 20 minutes. 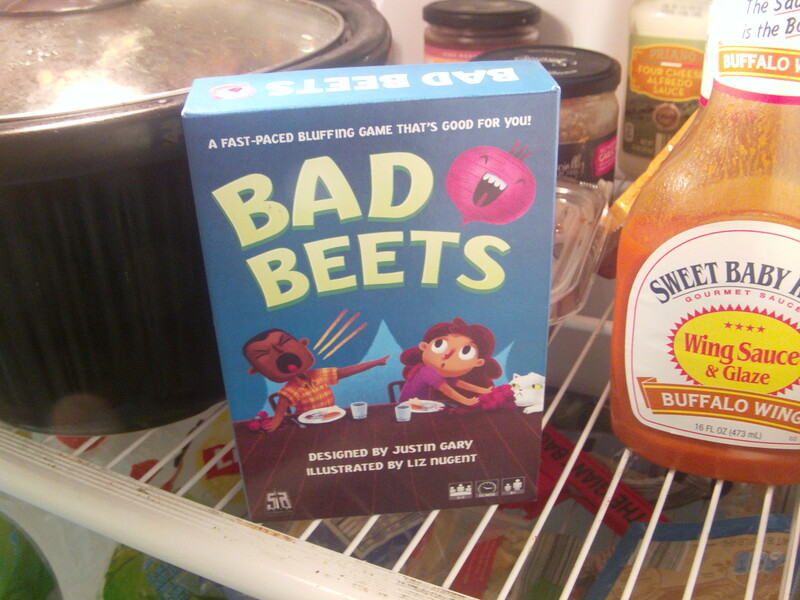 The premise of this game is simple: for dinner, you have been served a plate of eight beets. If you clear your plate, you get to eat dessert. The first player to eat dessert three times wins the game. How will you accomplish this? By lying and cheating like any child would when faced with the prospect of actually eating beets. Each turn you will have two cards in front of you at which only you will be allowed to look. You will keep one and pass the other to the player on your left (who won’t be allowed to look at it until their turn.) You then have a choice. 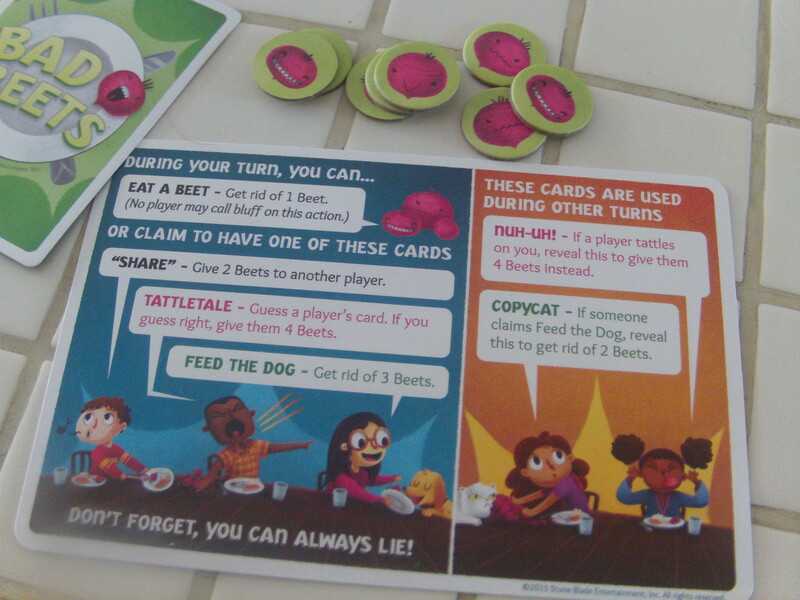 You can either be honest and eat a single beet (returning it to the pile of beets at the center of the table), you can do the action on your card (which will still remain hidden from the other players), or you can lie about the action on your card and do an action listed on a different card (there are a total of three of these bluffable actions). Once you announce what you are doing (so long as that action isn’t eating a beet) another player may call your bluff about what is on the card in front of you. If you were lying, you don’t get to take that action and have to put an additional beet on your plate as a penalty. If you were telling the truth, you still get to take that action and the person who called you out must put an additional beet on their plate as a penalty. 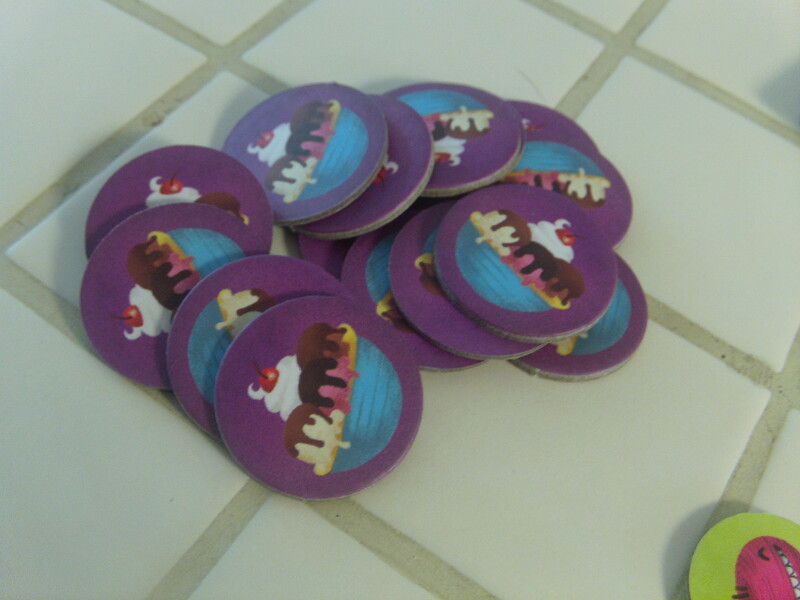 Just as the actions themselves are suited to the theme of the game, the endearing art on them and the tokens also work together to create a charming game. 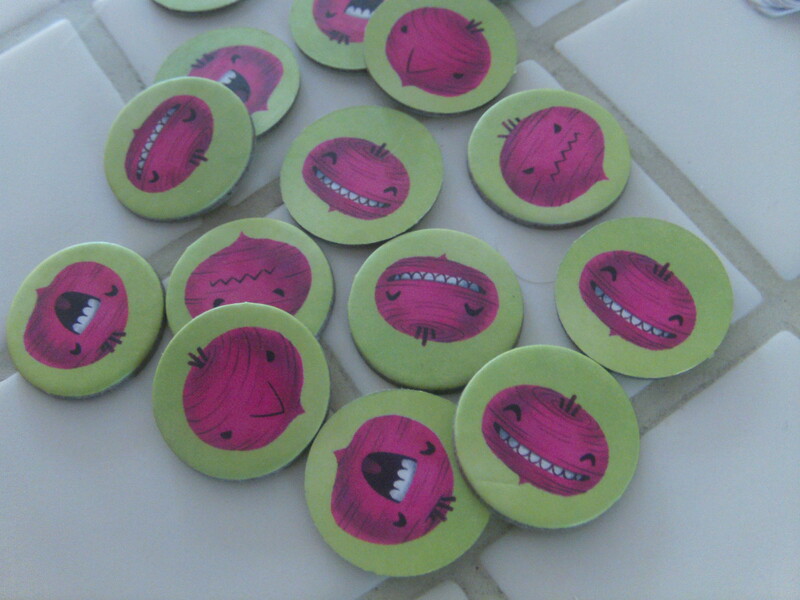 While you’re waiting for your turn, you’ll notice that the individual beet tokens have different faces on them, as if the beets themselves are players in a much larger game of dinner. It makes you want to “eat” them even less. And speaking of sentient beings that one shouldn’t eat- children not only enjoy this game, but surprisingly excel at it. I’ve said it before and I’ll say it again- I love playing a game where I get to lie to children and they get to try to lie back to me. Watching the tiny gears turn in their heads as they realize that they have actual choices to make in this game (as opposed to their usual fair of Candy Land or Hi Ho! Cherry-O) is always a delight.